In the meantime, URBANA Force was having a tough time in front of strong defenses around the junction of the trails which forked toward Buna Village and Buna Mission (a.k.a. Buna Government Station) from the Dobodura-Buna track. This area was known as the Triangle. Adding to some of the confusion as a result of the mixed units was the fact that both of the two main units had the designation “2D Battalion” and both were commanded by an officer named Herbert Smith (both were Wisconsin National Guard officers). The 2D Bn., 126TH Inf. was commanded by Maj. (later Lt. Col.) Herbert M. Smith, from Neillsville, WI. The 2D Bn., 128TH Inf. was commanded by Lt. Col. Herbert A. Smith, from Oshkosh, WI. Both Smiths were longtime Wisconsin National Guard officers and both of them had served with the 128TH Inf. for many years. Maj. H. M. Smith, in his book, Four Score and Ten, stated “I was going to inquire of Division how to distinguish between the two Herb Smiths and the two 2nd Battalions. Their radio reply was that I was Red Smith and the other Herb was White Smith.” (94-5). If there was a specific reason why he was ‘Red’ and the other was ‘White’, he did not explain it. At least one reference states that the decision was made by the Division Commander, Maj. Gen. Harding, but again, no reason was given. Lt. Col. Herbert A. Smith, 2D Bn., 128TH Inf., was the commander of URBANA Force. “As soon as reconnaissance indicated what a strong position the Japanese had developed at The Triangle, he [Lt. Col. Smith] began flanking operations to both sides of what appeared to be the main position. These movements, pressed for several days and nights under conditions of almost incredible hardships, had to be made through swamps which were at times neck-deep. Company G, 128th Infantry (Lieutenant Theodore Florey), spent a miserable night in the deepest part of one of these swamps. On both flanks, the envelopments emerged against enemy positions as strong as those at the The Triangle. On 27 November 1942, Colonel John W. Mott assumed command of URBANA Force. General Harding had sent his Chief of Staff to the area to evaluate the situation, with authority to assume command if he thought it would be beneficial. After Col. Mott took over command of URBANA Force, Lt. Col. Smith could concentrate entirely on his own battalion. Col. Mott began planning an attack for the night of 29-30 November. In addition to these problems, by 28 November, there was only one operational supply boat left, the others had been damaged or destroyed by enemy action or accidents. There weren't enough aircraft available to adequately supply the troops solely by air. Once supplies did land at the Dobodura air strip, they still had to be transported to the front, 10 or 12 miles away. The few available trails were not suitable for vehicles. Natives were hired to carry supplies and help evacuate the wounded, but they would not go into the areas being reached by enemy fire. The soldiers had to carry the supplies the rest of the way themselves. On 30 November an attack was scheduled for URBANA and WARREN Forces. Both attacks were better planned and organized than previous attempts. The fire support was better coordinated on both fronts. URBANA Force’s attack commenced before dawn, after a difficult advance through the swamps the night before. Part of 2D Bn., 126TH Inf. got within 100 yards of Buna Village, but could not take it. Company F, 128TH Inf. was able to sever the enemy’s communications between Buna and Sanananda. “Winners of the Distinguished Service Cross during this operation were Lieutenants Erwin J. Nummer and Cladie A. Bailey, and Sergeant Boyd L. Lincoln. (Blakeley 73)” More information about these three Soldiers and their medals can be found below as well as on the roster of DSC recipients. Several Soldiers earned the Silver Star for their gallantry on 30 November. Some of them are listed below and more information about them and their medals can be found on the roster of Silver Star recipients. At this point you should return to the main Battle of Buna page for some information related to the 32D Division as a whole. You will then be directed back to this point at the appropriate time. On about 2 December 1942, Colonel John E. Grose, I Corps inspector general, took over command of URBANA Force. Brig. Gen. Frayne Baker, who was in command of the Division’s elements in Australia, succeeded Gen. Waldron as acting Division commander. General Byers assumed command of the forward elements of the 32D. The 2D Bn., 126TH Infantry, with Cannon Company, 128TH Inf. on its left, was the main effort. Cannon Company soon ran into trouble so it was reinforced with a platoon from Co. F, 126TH Inf. (Lt. Paul L. Schwartz). Maj. Chester M. Beaver (Division staff) became the commander of Cannon Company, and together with Lt. Schwartz’s platoon, managed to get to the edge of the village. Company E, 126TH Infantry (Capt. Schultz), also made it to within 50 yards of the village. Lt. Thomas E. Knode and 1st Sgt. Paul R. Lutjens were severely wounded while gallantly leading their platoons. Sgt. Harold E. Graber, also from Co. E, 126TH, was killed when he attacked an enemy strongpoint while firing a light machine gun from the hip. Lt. Robert H. Odell (Commander of Co. F) had the unique experience of receiving his attack orders from a three star general, Lt. Gen. Eichelberger. The attack, led by Lt. Odell and 1st Sgt. George Pravda, initially made some progress but was soon stopped with heavy casualties. Also, the 2D Battalion, 128TH Infantry had surrounded the Japanese positions to the right rear of the troops advancing on Buna Village. “For their parts in this day’s work, the Distinguished Service Cross was later awarded to General Waldron, Colonel De Graaf, Colonel Rogers, Lieutenant Colonel Howe, Major Beaver, Captain Edwards, Lieutenants Schwartz and Knode, and Sergeants Lutjens, Graber and Bottcher. (Blakeley 91)” First Sgt. Lutjens received a battlefield promotion to 2d Lt., and S. Sgt. Bottcher was promoted, at the recommendation of General Eichelberger, directly to the rank of Captain. More information about these Soldiers and their medals can be found below as well as on the roster of DSC recipients. Lt. Col. Howe earned the DSC for his actions 5 December; when a unit which had lost its officers and its momentum, he rallied the unit and led it in an attack at Buna Village. He had entered the service as a Pvt. at the beginning of WWI. After completing the First Officers’ Training Camp at Fort Sheridan, IL, he was commissioned and served as an Air Corps pilot during WWI. He was Capt. and commander of Co. K, 126TH Inf., Michigan National Guard, at Grand Rapids, MI, when the 32D Div. was mobilized on 15 Oct. ‘40. First Lt. Knode was bestowed with the DSC for his actions 5 December at Buna Village. He was born in California but spent some of his formative years in the Washington D.C. area. He entered the service Mar. ‘42 at Washington D.C. and was commissioned 2d Lt. He was offered a desk job in Army radio due to his employment in media field before the war, but he turned it down. He was WIA twice at Buna; at least one of those was quite serious. After 11 months in hospitals he was retired as Capt. in Nov. ‘43. He returned home and resumed working in media again. Several other Soldiers were decorated for their heroic actions in the Buna-area on 5 and 6 December. The following personnel earned the Silver Star for their actions 5-6 December in the Buna-area. More information about them and their medals can be found below and on the roster of Silver Star recipients. On 7 December, Col. Tomlinson succeeded Col. Grose as commander of URBANA Force. Col. Grose had been promised command of the 127TH Infantry, which was then preparing to move from Port Moresby to the combat zone. Col. Grose had been at the front in command of URBANA Force for 5 whole days; he used his pending command of the 127TH as an excuse to ask Brig. Gen. Byers to transfer command of URBANA Force to Col. Tomlinson, who had been on the front line since day one. Seeing as Col. Grose and Brig. Gen. Byers worked together on General Eichelberger’s staff, it is no surprise that Grose’s request was granted and he was soon headed to the rear. “Acting as a forward outpost, Mitchell detected the enemy force from the village while it was creeping forward under cover of the jungle. Just as it was about to launch its attack, he charged at the Japanese suddenly with a loud yell and bayonet fixed. Mitchell so surprised and dumbfounded them that instead of continuing with the attack they hesitated and momentarily fell back. His yell alerted the rest of the force, with the result that when the Japanese finally did attack they were cut down. Mitchell escaped without a scratch. (Milner 249)” Cpl. Mitchell was also lauded when, on 9 December, he seized a Japanese prisoner and brought him back to be interrogated. “Later in the day [7 December], Maj. [Herbert M.] Smith was severely wounded while encouraging the attacks of Companies E and G. (Blakeley 92)” The mortar round that wounded Maj. Smith also killed two soldiers and wounded two more. Maj. Smith was succeeded by Capt. William Francis ‘Jimmy’ Boice (S-2, 126TH Inf.) as Commander of 2D Battalion, 126TH Infantry. A platoon-sized company, commanded by Lt. Odell, achieved the only gain of the day. That evening the Japanese attempted to reinforce the Village by sea from the Mission (a.k.a. Government Station), but the attempt was prevented by machine gun fire from Capt. Bottcher, who had been wounded during the day. The U.S. Army Center of Military History volume, The Chemical Warfare Service: Chemicals In Combat, contains several chapters devoted to the development and use of the portable flame thrower during WWII. The authors, Brooks E. Kleber and Dale Birdsell, used the 32D Division’s first attempted combat use of flame throwers as one example to highlight the unreliability of the early models. “On 6 December Col. Clarence M. Tomlinson, commanding officer of the 126th Infantry, 32d Division, asked the 114th Engineer Combat Battalion for several flame throwers and operators to help overcome enemy machine gun emplacements near the village of Buna. The engineers, equipped with the E1R1 flame thrower, immediately set about testing and servicing these weapons. Although the inspections showed that several of the gas cylinders had developed leaks, some from rust, some from defective material, the flame throwers functioned reasonably well, if at a maximum range of only 20 yards. Five operators with two weapons, two refill tanks, and 25 gallons of fuel, reported to the regiment on 7 December, and the next day the regimental operations officer ordered the flame throwers into action. The target was an enemy machine gun bunker ingeniously concealed at the edge of a kunai grass flat. While the flame throwers were being brought forward, M/Sgt. John K. King, of the division chemical section, and one of the company officers, Lieutenant Davidson, performed the necessary reconnaissance. They identified the bunker in the midst of its natural and artificial camouflage and exposed themselves in order to draw fire and pinpoint the location of its ports. A partially demolished breastwork about 35 yards from the bunker furnished cover for anyone approaching the position. It was possible to advance a bit farther toward the bunker in comparative safety through a shallow trench which extended 5 yards out from the breastwork. This would give the operator an attack position only 30 yards from his target. “After the reconnaissance Lieutenant Davidson went forward again, this time accompanied by Cpl. Wilber G. Tirrell, the engineer flame thrower operator. Once more he drew fire from the bunker so that the corporal could see the exact location of the ports. “The plan of operation was practicable and uncomplicated. Corporal Tirrell, his weapon concealed in a burlap sack, was to advance as far as possible in the shallow trench, thirty yards from his objective. As a diversion, three men with automatic weapons were to crawl around on the left flank and fire at the rear of the bunker. Lieutenant Davidson, Sergeant King, and four riflemen were to take positions behind the breastwork, ready to rush the bunker with rifle fire and grenades in the wake of the flame thrower. Corporal Tirrell was to advance at least five yards beyond the end of the trench before releasing the flame and was to keep advancing until the fuel was exhausted. “Before the men took their stations, they checked the flame thrower’s ignition system. At the proper moment, the group on the left flank began its diverting fire. The enemy did not answer. Corporal Tirrell moved from his position at the end of the shallow trench and headed toward the bunker. Seven yards beyond the trench he released the initial burst of flame and immediately Lieutenant Davidson and his party rushed out from behind the breastwork, only to find themselves in serious trouble. Instead of a powerful burst of flame, the flame thrower emitted a feeble 10-foot squirt, and the Japanese inside the emplacement began pouring machine gun fire into the advancing group. One of the riflemen was hit as soon as he left the cover of the breastwork, Lieutenant Davidson was killed, and the others withdrew. Corporal Tirrell continued to advance, trying vainly to get his weapon to function properly. When he was less than fifteen yards from the bunker he was stunned by a bullet which struck the front of his helmet and he fell to the ground out of sight. During the night he crawled back to safety. Two days later the infantry overcame the position by direct assault. The portable flame thrower was later put to effective use throughout the rest of WWII, so obviously its early shortcomings were eventually overcome. Unfortunately, that was of no help to the 32D Division at Buna. Second Lt. Downer, from Illinois, was posthumously bestowed the DSC for his actions on 9 December. More information about him and his medal can be found on the roster of DSC recipients. By this time, the battalion was reduced to a total strength of about 150 men. The exhaustion from almost constant combat was magnified by extremely hot days and torrential rains at night. The 127TH Infantry was now arriving at the front. Col. Grose had taken command of the regiment from Lt. Col. Edwin J. Schmidt, who now became the XO. On 10-11 December the 3D Battalion, 127TH Infantry relieved the 2D Bn., 126TH. Sgt. Winzenried, from Menasha, Wisconsin, was a Pfc. in Co. I, 127TH Inf., Wisconsin National Guard, at Neenah, Wisconsin, when the 32D Div. was mobilized 15 Oct. ’40. More information about him and his medal can be found on the roster of DSC recipients. At 0700 on 14 December, after a comprehensive preparation by the 25-pounders and mortars, there was an all-out attack on Buna Village. Company K, 127TH Inf. was the main effort, Co. I was in support on the left flank. “The advance continued steadily and cautiously. There was no opposition. By 1000 the entire area was overrun. Moving slowly and warily because they feared a trap, the troops soon discovered that none existed. (Milner 252)” Apparently the Japanese, reduced to an effective strength of only 100 troops, saw the writing on the wall and had evacuated the Village the night before by swimming along the coast to the west. “After all the bitter fighting that had raged on its outskirts, [Buna Village] had fallen without the firing of a single enemy shot. “The village was a mass of wreckage. Its few huts had been blown to bits; the coconut palms in the area were splintered and broken by shellfire; and there were craters and shell holes everywhere. The bunkers still stood, despite evidence of numerous direct hits registered upon them by the artillery. The Japanese had left little equipment and food behind: a few guns, some discarded clothing, a supply of canned goods, and a store of medical supplies. Later in the day, Company K eliminated a small group of Japanese found east of the Village. “Sergt. Davidson had led various attacks and would have been a lieutenant had he lived. There was one big pillbox of heavy logs and dirt just off the trail which had to be taken out. It was decided to try a flamethrower and Davidson went along with an officer in the chemical warfare unit. Davidson was a Pfc. in Co. E, 126TH Inf., Michigan National Guard, at Big Rapids, MI, when 32D Div. mobilized on 15 Oct. ‘40. The newspaper article above stated he was KIA “about Dec. 7” but his memorial monument at West Cemetery, Mecosta County, MI, states he was KIA 14 December. Neither date is an exact match for the two known flame thrower attempts on 8 Dec. (above) or 16 Dec. (below). Maybe there was another attempt to employ flame throwers, or maybe one of the dates is off a day or so. Either way Sgt. Davidson was admired for his bravery, but does not appear to have been decorated for it. Soldiers of 2D Bn., 127TH Inf., 32D Division, on alighting from a transport plane, adjust their clothing and equipment on 15 Dec. 1942. The plane took them from Port Moresby, New Guinea to the Dobodura Airstrip, 8 miles SW of Buna, New Guinea. Soldiers of 2D Bn., 127TH Inf., 32D Div., on alighting from a transport plane (C-47 named Eager Beaver), adjust their clothing and equipment on 15 Dec. ‘42. The plane carried them from Port Moresby, New Guinea to the Dobodura Airstrip, 8 miles SW of Buna, New Guinea. Soldiers of the 14TH Portable Hospital (attached to 3D Bn, 127TH Inf., 32D Division), along the Buna front (near the Dobodura Airstrip) about 8 miles south of Buna on 15 Dec. 1942. Col. Edwin W. Swedburg and some of his soldiers from 3D Bn., 127TH Inf., 32D Division, standing before a Japanese pillbox at Buna Village, New Guinea on 15 Dec. 1942. Next, URBANA Force would turn its attention to the Coconut Grove, southeast of Buna Village, with the objective of clearing the Japanese from it. This task was assigned to 2D Bn., 128TH Infantry, commanded by Lt. Col. Herbert A. Smith. By now the battalion was down to about 350 men, and only about 100 of these were available to start the attack. 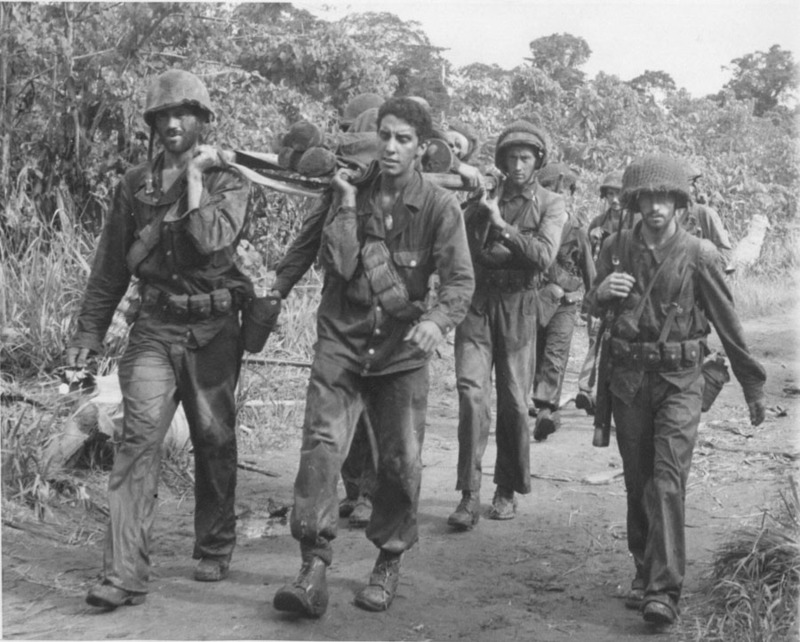 Several Soldiers also earned the Silver Star for their actions during the attack on the Cocoanut Grove on 16 December. They are listed below and more information about them and their medals can be found on the roster of Silver Star recipients. This table contains ten Associated Press photos taken in the Buna area in November and December of 1942. These photos were contributed in memory of Edward S. Anderson, a 32D Infantry Division Veteran who served with the 114TH Eng. Bn. (Companies A & C) in New Guinea and the Philippines. The photo captions, in italics, are the original captions from when the photos were taken. The photos were contributed by M. Anderson, Edward Anderson’s nephew. 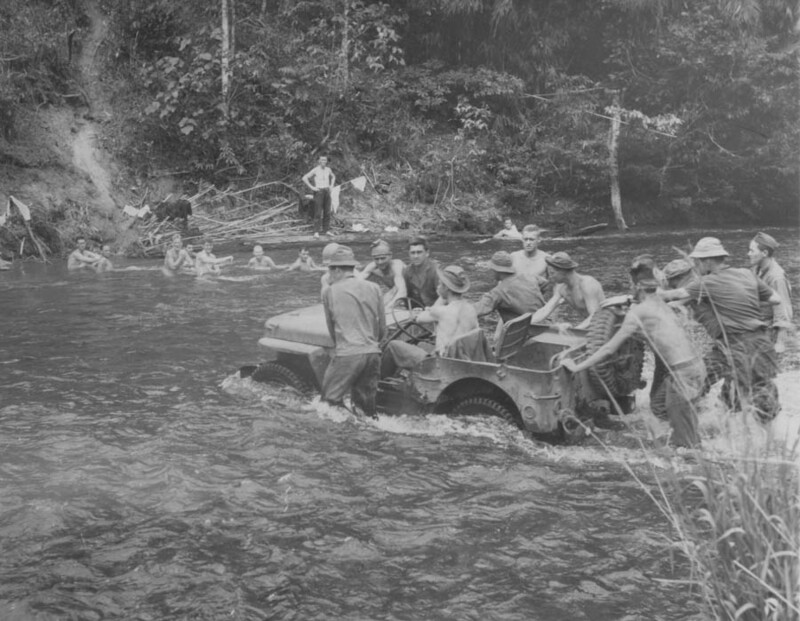 “Scout Car Crosses Stream on New Guinea – An army scout car takes a jungle stream in New Guinea with ease - - more or less. While soldiers push, some of their buddies watch from the “privacy” of their bath. 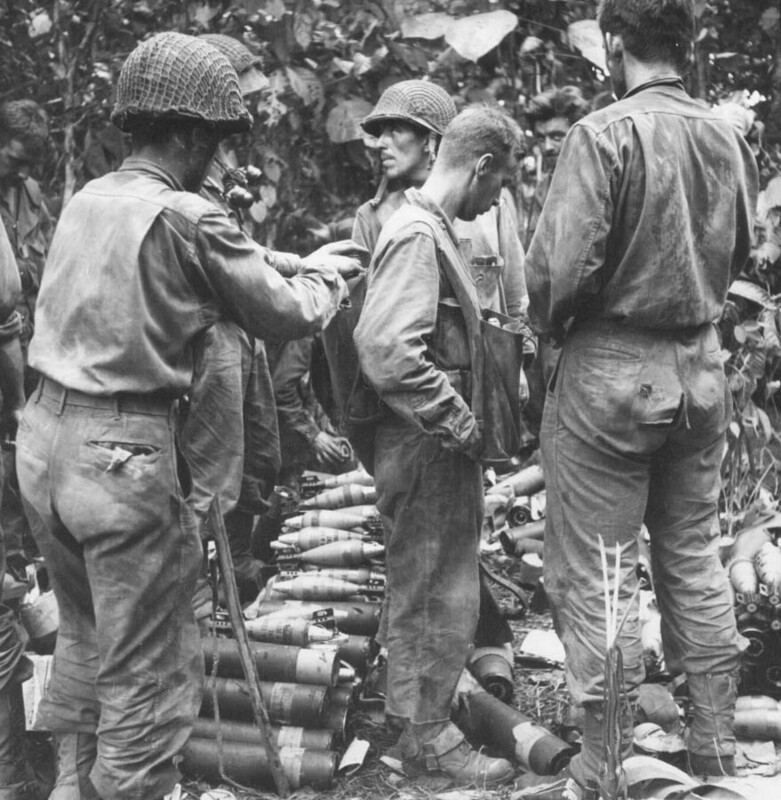 The Americans were reported, Nov. 13, to be pushing the Jap army down the Buna trail.” Associated Press photo dated 11-13-42. “Peeps in New Guinea Traffic Jam – Heavy traffic on a jungle trail in New Guinea has American Peeps moving in single file – no passing to the right. The Army vehicles move up with no room for anything much coming in the opposite direction.” Associated Press photo dated 11-14-42. “Mortar Blasts at Japs in New Guinea – An American three inch trench mortar, almost hidden in a deep New Guinea jungle lets loose at a Jap position as the combined force of Australians and Americans under General MacArthur worked its way across the Owen Stanley Mountain Range to trap the enemy in the Buna-Gona area.” Associated Press photo dated 12-15-42. 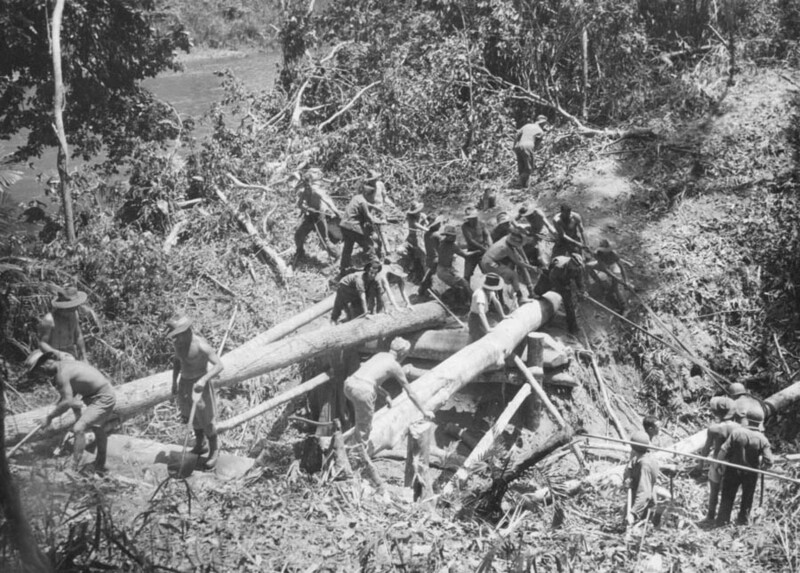 “Allies Toil Across New Guinea to Attack Japs – Working their way across the trackless New Guinea jungles and mountain wastes of the Owen Stanley Ranges, to get a crack at the Japs in the Buna-Gona area, engineer troops of a combined Australian-American task force under General MacArthur build a bridge to move men and equipment to an advance base on jeeps and motorized transport. After almost three months they finally trapped the Japs along Buna Bay.” Associated Press photo dated 12-15-42. 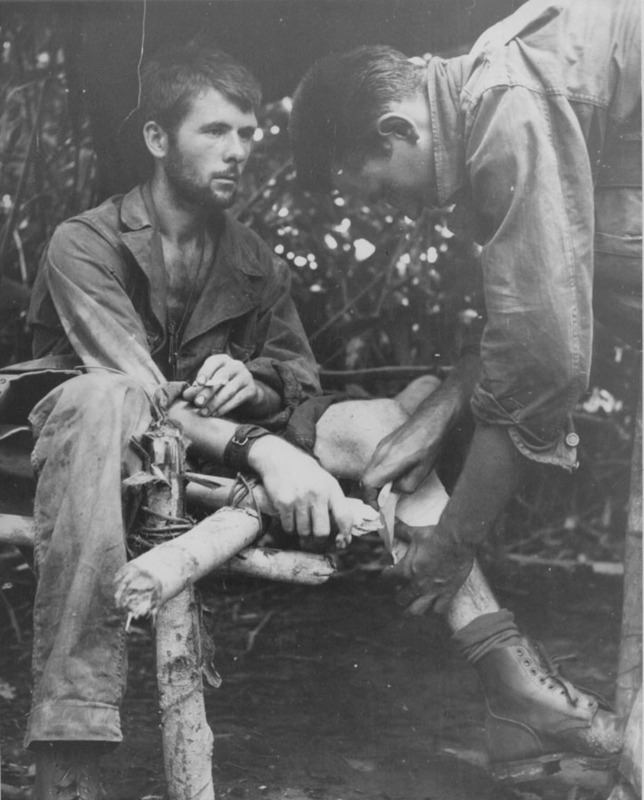 “’Wild Man’ From Michigan Takes Jap Bullet Calmly – Described as a “Wild Man” at the front and credited with killing between 30 and 40 japs as his unit cross New Guinea to trap the enemy in the Buna-Gona area, Private First Class Orin Sutton (left) of Charlevoix, Mich., sits calmly and has his leg bandaged after he was hit by a Jap machine gun bullet. He was back in action in less than 24 hours. Doing the bandaging is Private First Class Allie Poole of Petersburg, Mich.” Associated Press photo dated 12-15-42. “Manpower Moves Ammunition for Attack on Japs – Ammunition for three inch trench mortars is loaded on the back of a pack carrier for transport to weapons set up in the jungles of New Guinea as a combined Australian and American task force under General MacArthur advanced against the Japs and trapped them in the Buna-Gona area.” Associated Press photo dated 12-15-42. 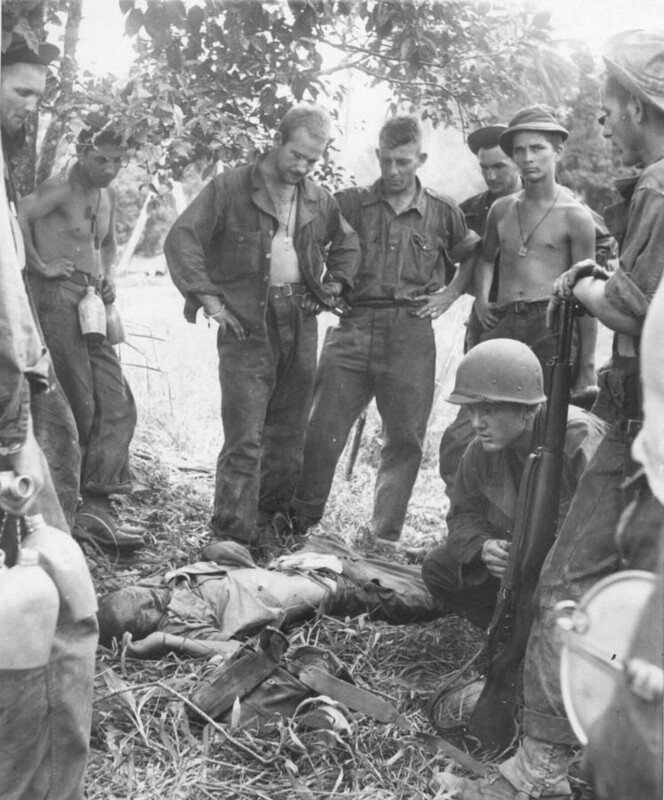 “Exhausted Jap Prisoner Observed by Americans – American soldiers on the Buna front watch an exhausted Japanese prisoner. This picture is one of several release by the Army from among those made by Edward Widdis, Associated Press photographer, who was encamped with the fighting forces just 100 yards behind the front in Buna.” Associate Press photo dated 12-18-42. 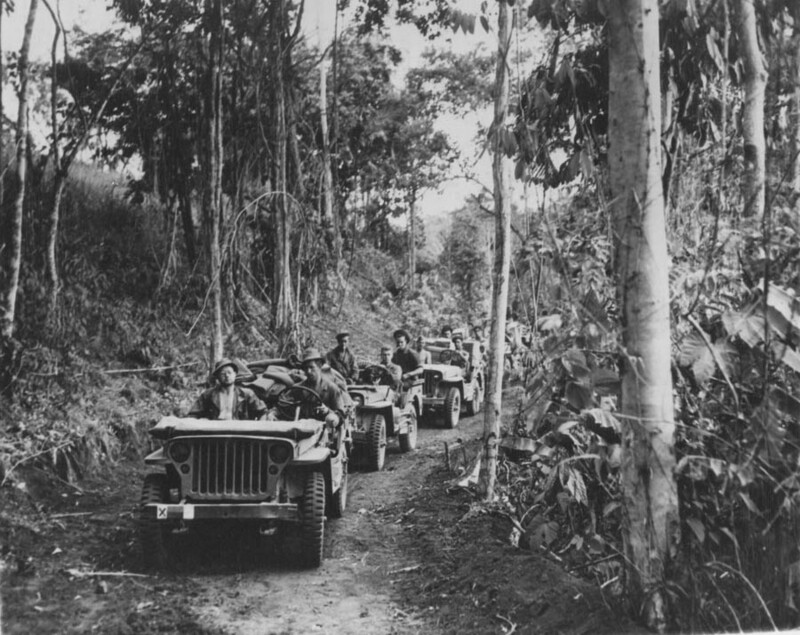 “Moving in For Jap Flank – Moving along the Buna Road in New Guinea, these American soldiers were to open a flanking movement against the Japs in the bitter fighting in that area. They moved up toward the Japs single file, well scattered.” Associate Press photo dated 12-18-42. “Hot Food Comes to a Fox Hole – Hot food has come up to these soldiers in the line on the Soputa front near Buna, New Guinea. These Americans were in the line 11 days. Hot food was brought up through the jungle and underbrush as often as possible despite the danger. L. to R.: Private William Mills, Sommerville, Mass. ; Private Hebert Van Lier, Boston, Mass. ; Private Edward K. Fairbanks, Sommerville, Mass. ; and Sgt. Joseph P. Doran, Nahant, Mass.” Associate Press photo dated 12-24-42. Meanwhile, the engineers were making progress constructing jeep trails to the front, although they needed to build a bridge a hundred feet long to cross a stream that was only six feet wide but bordered by swamps. These improved trails would make supply, evacuation and communication easier. 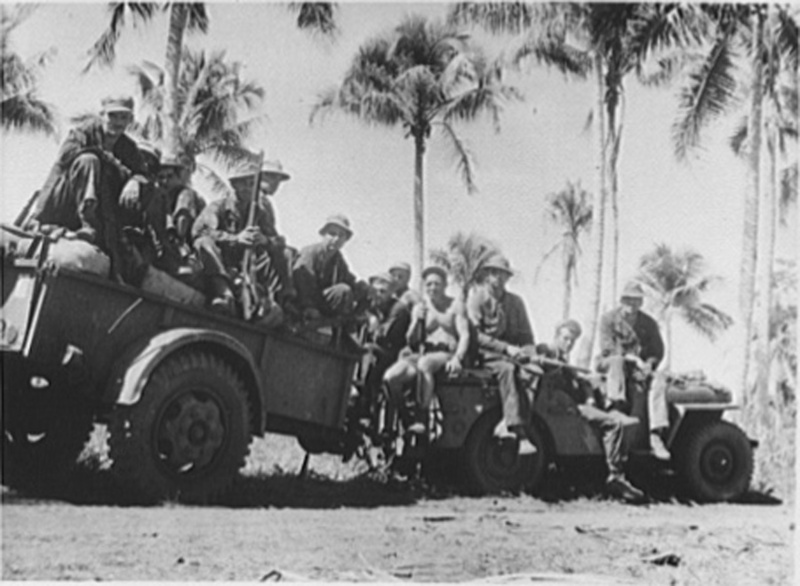 Soldiers and supplies on the way to the front line at Buna. General Eichelberger scheduled the next attack for 18 December. WARREN Force was assigned the successive objectives of Cape Endaiadere, the New Strip, the Old Strip, and Giropa Point. URBANA Force would be tasked with cleaning out the Triangle, driving through to the coast, and cutting the coast road between Giropa Point and Buna Mission (a.k.a. Buna Government Station). The capture of Buna Village and the anticipated arrival of the 127TH Infantry had improved the situation, but the Japanese still held Musita Island, they were still firmly entrenched in the Triangle, and Entrance Creek would prove to be a difficult obstacle. In order to increase protection of the left flank, the 128TH Inf. detachment at Siwori Village was replaced by a platoon of the 126TH Inf. (Lt. Alfred Kirchenbauer), and a detachment from Co. F, 126TH Inf. (Lt. Schwartz), was sent to Tarakena, west of Siwori Village. On 18 December, the 2D Battalion, 128TH Infantry was relieved by the just arrived 2D Battalion, 127TH Infantry, commanded by Lt. Col. Loren L. Gmeiner. On 18 December, Co. L, 127TH Inf. (Capt. Roy F. Wentland), attempted to occupy Musita Island, which was separated from the mainland by an un-fordable tidal stream. No bridging equipment was available, so the Company was forced to cross with the help of a cable, carried across by swimmers. At first, there was no opposition, but they encountered intense enemy fire as they moved to the east end of the island. Five men, including Capt. Wentland, were killed and six were wounded. That night, for reasons that are not clear, the company was ordered to withdraw to the mainland. Capt. Roy F. Wentland was from Ripon, WI. He was a 2d Lt. assigned to Co. E, 127TH Inf., Wisconsin National Guard, at Manitowoc, WI when 32D Div. mobilized on 15 Oct. ‘40. 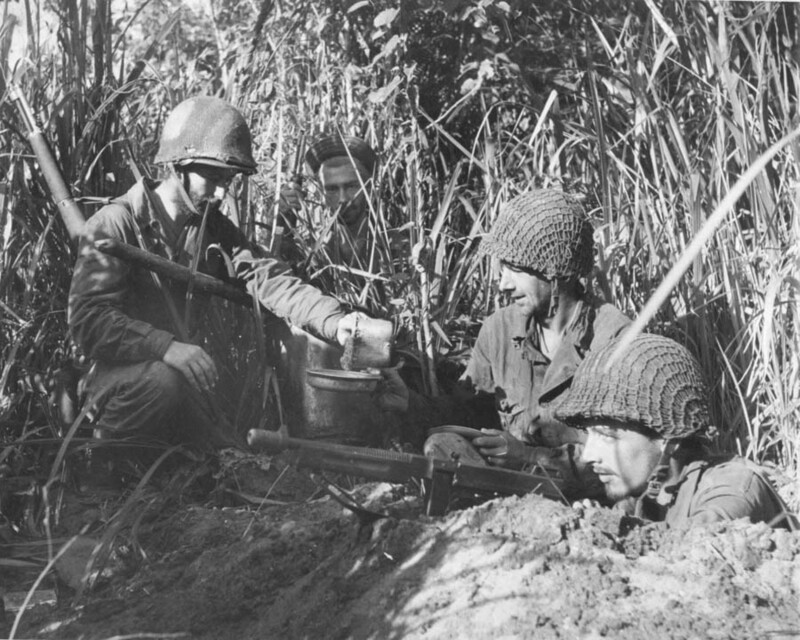 By order of General Eichelberger, two additional attacks were attempted, with the support of all available mortars, but both were halted by strong defensive fire from the mutually supporting Japanese bunkers. The following day, Col. Tomlinson started to take the remnants of the battalion, now down to a total of about 240 men, out of the line and replace it with units from the 127TH Infantry. Capt. Bottcher was later bestowed with the OLC to the Distinguished Service Cross for his actions near Buna on 20 December. He was also WIA for about the third time in two weeks. He had been bestowed with his first Distinguished Service Cross only about nine days earlier. More information about him and his medal can be found on the roster of DSC recipients. 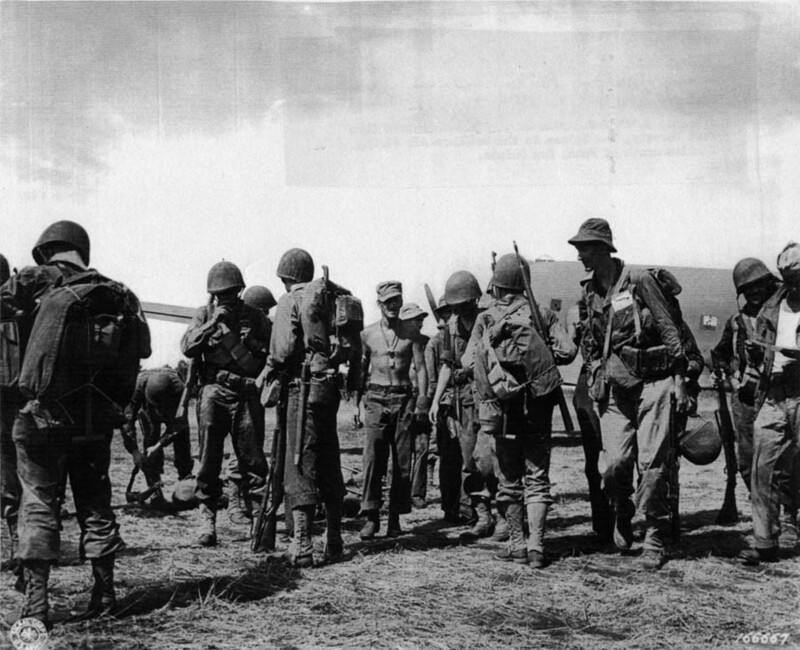 Several Soldiers earned the Silver Star for their gallantry on 20 December near Buna. Some of them are listed here and more information about them and their medals can be found on the roster of Silver Star recipients. That evening, Col. Grose resumed command of URBANA Force; as the 127TH Infantry became the major element. General Eichelberger now decided to contain and bypass The Triangle, by attacking across Entrance Creek to the north. On the night of 21-22 December, Co. K, 127TH Infantry (Capt. Alfred E. Meyer) succeeded in crossing the creek, after several daylight attempts had failed. Lt. Edward M. Greene Jr. had led the first attempt to string a rope across the un-fordable stream, and was killed in the process. Co. K lost 54 killed and wounded. Early on 22 December, Co. I (Capt. Michael F. Ustruck) crossed the creek on a footbridge, constructed by the engineers further upstream, and linked up with Co. K. Also around this time, Lt. Schwartz’s detachment at Tarakena had encountered problems and he had to be reinforced with small detachments from 2D Bn., 126TH Inf. Lt. Schwartz was wounded and replaced by Lt. James R. Griffith, who also became a casualty. Lt. Louis A. Chagnon, 127TH Infantry, assumed command of the detachment when he was sent over there with a small detachment from Headquarters Company and Service Company of the 127TH. On 22 and 23 December, Musita Island was cleared by elements of the 127TH Infantry. Company H's heavy weapons were then able to fire on Buna Mission (a.k.a. Buna Government Station) from a position on the island. “The attack ran into trouble from the start, but the day was marked by an unusual number of acts of gallantry. An enemy grenade fell close to Capt. Ustruck of Company I. His First Sergeant, Elmer J. Burr, instantly threw himself on the grenade, smothering the explosion with his body and saving Capt. Ustruck’s life. For his act of ‘conspicuous gallantry and intrepidity in action above and beyond the call of duty,’ Sergeant Burr was posthumously [bestowed] the Medal of Honor. (Blakeley 104)” First Sgt. Burr was a Wisconsin National Guard Soldier in Co. I, in Neenah, Wisconsin, when the 32D Division was activated on 15 Oct. ‘40. He was from Menasha, Wisconsin. First Sgt. Burr’s Medal of Honor citation can be read on the 32D Division Medal of Honor page of this web site. Co. L was the main effort for the drive across the Government Gardens. The commander of Co. L, Capt. Wentland, had been killed; the Company was now commanded by Lt. Marcellus P. Fahres. 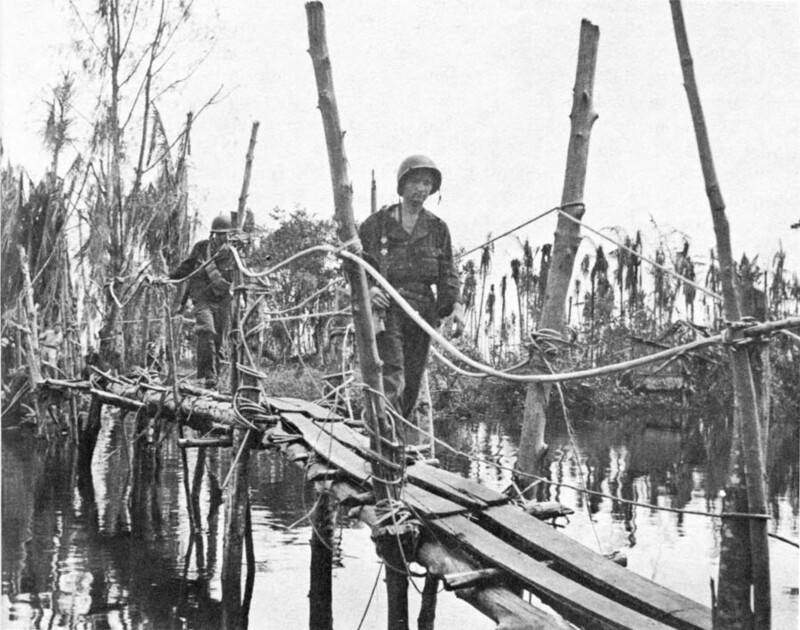 A platoon of Company L (led by Lieutenants Frederick W. Matz and Charles A. Middendorf) made a quick advance through the tall kunai grass; aided by most of the available fire support and a diversion created by an unsuccessful attack across the north bridge from Musita Island by a platoon of Company A.
Japanese-made footbridge over Entrance Creek from Musita Island to Buna Mission (a.k.a. Buna Government Station). When Co. L was held up by enemy fire on the outskirts of the Plantation, Sgt. Kenneth E. Gruennert, who was in the lead, alone eliminated two pillboxes that were holding up the advance, at the cost of his life. Sgt. Gruennert was posthumously awarded the Medal of Honor. Sgt. (then Pfc.) Gruennert was a Wisconsin National Guard soldier in Co. L, in Jefferson, Wisconsin, when the 32D Division was activated on 15 Oct. 1940. Sgt. Gruennert’s Medal of Honor citation can be read on the 32D Division Medal of Honor page of this web site. “Under fire from both the Japanese and their own artillery, [and out of contact with their Company] the men of the platoon were in a desperate situation. Lieutenant Middendorf was killed and Lieutenant Matz had only eight men left, one of them seriously wounded. Matz decided to send the other men back and to stay with the wounded man. It took the men two days to get back and it was eight days before Matz was rescued. [2d Lt.] Matz was awarded the [Distinguished Service Cross]. (Blakeley 105)” The wounded man that Lt. Matz stayed with was Cpl. William M. Gleason, from Baldwin or Reed City, Michigan. Four of the eight other men were Sgt. Walter J. Wachowiak, from Milwaukee, WI; Cpl. Harold Dolson, Jackson, MI; Pfc. Elmer J. Amore, Lake Leelanau, MI; Pvt. William Richman, Cairo, IL. Pfc. Amore was KIA a few days later on 29 Dec. ’42. When Col. Grose discovered that the platoon had apparently broken through, he tried to move additional troops forward to consolidate the gain. Lt. Paul M. Krasne and eight men of Company K were the only ones who got through to the beach. They withdrew after finding no sign of the platoon from Co. L. Additional attempts to push the attack were unsuccessful. Lt. Gen. Eichelberger ordered Col. Grose to continue the attack on 25 December 1942. Eight companies of the 127TH were now available: A, C, F, G, I, K, L and M. Company F (Capt. Byron B. Bradford) made good progress and was able to establish a position about three hundred yards from the sea. “Captain James W. Workman, commanding Company C, was killed while leading an attack on a bunker. He was later awarded the [Distinguished Service Cross].” After Capt. Workman was killed, Capt. Millard G. Gray, General Eichelberger’s new aide-de-camp, assumed command of Co. C, 127TH Infantry, and was also later awarded the Distinguished Service Cross for his actions between 24 Dec. and 1 Jan.
“Sergeant William Fale, Private First Class William Balza and Private Gordon W. Eoff, all of Headquarters Company, 127th Infantry, also won the [Distinguished Service Cross] for their efforts to get telephone wire forward to companies which were out of communication with regimental headquarters. (Blakeley 107)” Sgt. Fale was from Sheboygan, Wisconsin (his DSC was bestowed posthumously because he was KIA the next day) [added 18 Dec. ‘12]; Pfc. Balza was from Sturgeon Bay, Wisconsin (some references list him assigned to HQ Co., 2D Bn., 127TH Inf. ); [added 15 Dec. ‘12]; and Pvt. Eoff was from Boone County, Arkansas. More information about them and their medals can be found on the roster of DSC recipients. Numerous Soldiers earned the Silver Star for gallantry on Christmas Day. Some of them are listed here and more information about them and their medals can be found on the roster of Silver Star recipients. LTC Loren L. Gmeiner, from Waupaca, Wisconsin, and the commander of 2D Bn., 127TH Inf., earned the Oak Leaf Cluster to the Silver Star for his actions on 25 December. He had earned his first Silver Star near Juvigny, France circa September 1918 while serving with the 32D Division during WWI. He was a 1LT in Howitzer Co., 127TH Inf., Wisconsin National Guard, at Waupaca, WI, as early as 1923. He was a CPT in charge of Anti-Tank Platoon, HQ Co., 127TH Inf. at Waupaca, WI, when the Division mobilized on 15 Oct. '40. 1LT James T. Coker, from Durant, Oklahoma and assigned to Co. F, 127TH Inf., earned the Silver Star for his actions 25 Dec. '42 near Buna. He had entered active service as a SGT with the 45TH Inf. Div., Oklahoma National Guard, at Durant, OK on 16 Sep. '40. PFC Rex N. Purk, from Kalamazoo, Michigan, and assigned to the 32D Div., earned the Silver Star as a medic for crawling through Japanese sniper fire to provide medical treatment for a severely wounded lieutenant and private near Buna Mission on Christmas Day. He also earned the OLC to the Silver Star for his actions as a medic on 20 December near Buna. Col. Bradley was awarded the Silver Star for his actions on 27 December; he was bestowed with the DSC for his actions on 28 December. More information about him and his medals can be found on the roster of DSC recipients and the roster of Silver Star recipients. Maj. (then Capt.) Schroeder was a Wisconsin National Guard officer in command of Co. C, 127TH Inf., in Oconto, Wisconsin, when the 32D Division was activated on 15 Oct. ‘40. Unfortunately, as you will read below, his DSC would be bestowed posthumously to his widow. More information about him and his medal can be found on the roster of DSC recipients. Capt. Gray, from Indiana, was bestowed with the DSC for his actions 25 Dec. ‘42 to 1 Jan. ‘43. More information about him and his medal can be found on the roster of DSC recipients. First Lt. McCampbell, from Nebraska, was bestowed with the DSC for his actions on 27 December. More information about him and his medal can be found on the roster of DSC recipients. The Japanese in The Triangle now realized that their position was untenable, and they successfully evacuated it without their departure being detected. Sgt. Charles E. Wagner and Pfc. James G. Greene, voluntarily and cautiously leading a detachment from Co. E, 127TH Inf. the evening of 28 December, discovered that The Triangle had been abandoned by the Japanese. “Urbana Force had accomplished its missions[!] (Blakeley 107)” It was evident the Japanese had hurriedly departed; heavy weapons, ammunition, and unburied dead were left behind. Sgt. Wagner and Pfc. Greene earned the Silver Star for their actions that day. 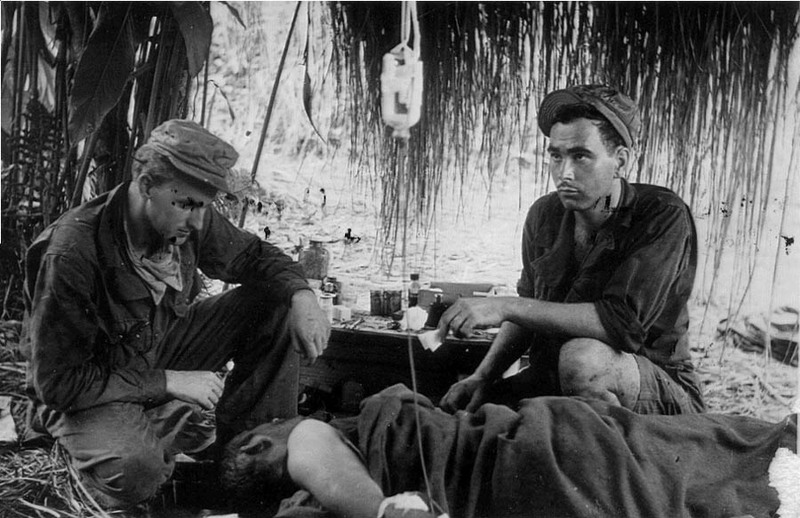 Soldiers treating wounded comrade a few hundred yards from the front line at Buna. Tec. 5 Gray was from Petersham, Massachusetts. Tec. 5 McDonough was from Reading, Massachusetts. [added 21 Dec. ‘12] Pvt. Hangartner was originally from Osseo, Wisconsin, but entered service from Detroit, Michigan. [added 19 Dec. ‘12] Pvt. Melanson was from Lynn, Massachusetts, and was in the National Guard. [added 22 Dec. ‘12] Pvt. Squires was from Akron, Ohio. [added 23 Dec. ‘12] Pfc. Mittleberger was from Scott County, Iowa. There is some discrepancy regarding his name, Milner lists him as ‘Earl Mittelberger’ and Blakeley lists him as ‘Karl Wittelberger’. [added 28 Dec. ‘12] More information about them and their medals can be found on the roster of DSC recipients. Two men from Co. K were wounded and fell into the water when the bridge collapsed. Neither could swim, they were forced to hide under the opposite bank with only their heads exposed above the water. About 30 hours passed before they could be rescued on 30 December by Lt. William W. (or H.) Bragg Jr., mortar platoon leader from Company H, and four enlisted men from the company who were able to swim across the creek after nightfall. The enlisted men were 1st Sgt. Andrew A. Kossel from Oshkosh, WI; Sgt. Norman E. Marine from Winneconne, WI; Pvt. Thomas King from South Bend, WA; and Cpl. William T. Connors from Chicago. S. Sgt. Miljatovich, from Milwaukee, Wisconsin, and assigned to Co. K, was bestowed with the Distinguished Service Cross for his efforts to lead the assault boat crossing on 28 December near Buna. He was a Pvt. in Co. K, 127TH Inf. Wisconsin National Guard at Milwaukee, Wisconsin, when the Division mobilized on 15 Oct. ‘40. More information about him and his medal can be found on the roster of DSC recipients. Several other Soldiers earned the Silver Star for their gallantry on 28 December. Some of them are listed here and more information about them and their medals can be found on the roster of Silver Star recipients. On 29 December, the 2D Bn., 126TH Inf. (minus the elements at Tarakena and Siwori Village) and 2D Bn., 128TH Inf., returned to the front line. Co. B, 127TH Inf., after moving a short distance, was able to establish a position on the beach. That night a patrol from Co. H, 127TH Inf. (Lt. Allan W. Simms) discovered a fordable gap between two sand spits that extended from the Village and the Mission (a.k.a. Government Station). This information was incorporated into the next attack, which included a pre-dawn attack across the two spits, together with attacks from the center and from Maj. Schroeder’s position on the right. Lt. Col. Herbert A. Smith was to command the operation. Note: There is some uncertainty as to the exact date and location of this specific event. During the Battle of Buna/Sanananda/Gona there were several occasions when Allied units attempted to break through to the beach in order to disrupt the Japanese defenses. The tale of these five brave medics is listed in this section because it seems the most likely time and location based on the unfortunately limited information available. Papuan Campaign lists 29 December as the date of action for the Silver Stars for all five men, but one newspaper article states that Pvt. Scarfo’s decoration was bestowed for his actions on Christmas Day. Christmas Day is certainly feasible, but it seems probable that the incident may have been in support of Co. B’s breakthrough to the beach described above on 29 December. 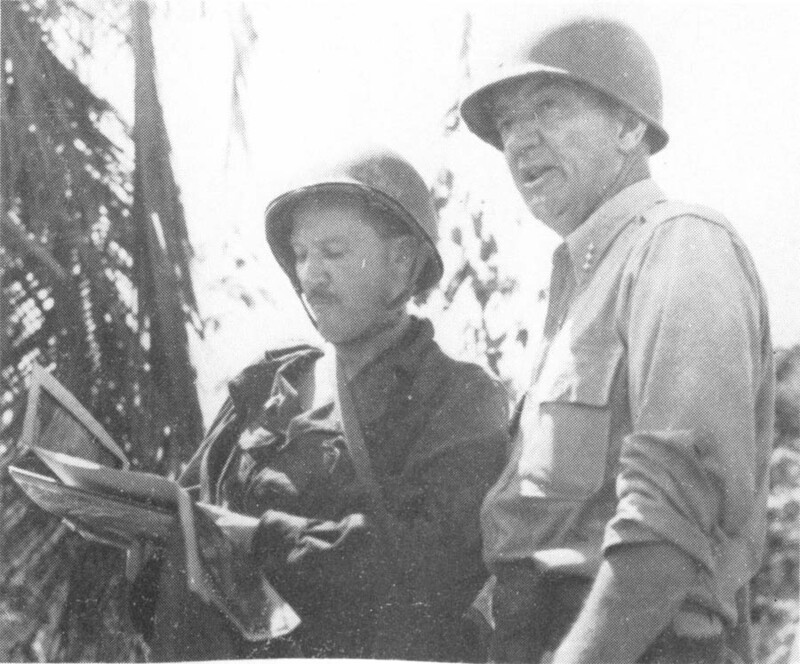 Col. Grose and Lt. Gen. Eichelberger discuss planning for the attack on Buna 31 Dec. ‘42. At 0430 on 31 December, Co. E, 127TH Inf. (led by Lt. Bragg of Co. H) started to cross the shallows, followed by Co. F, 128TH Infantry (CPT Jefferson R. Cronk). 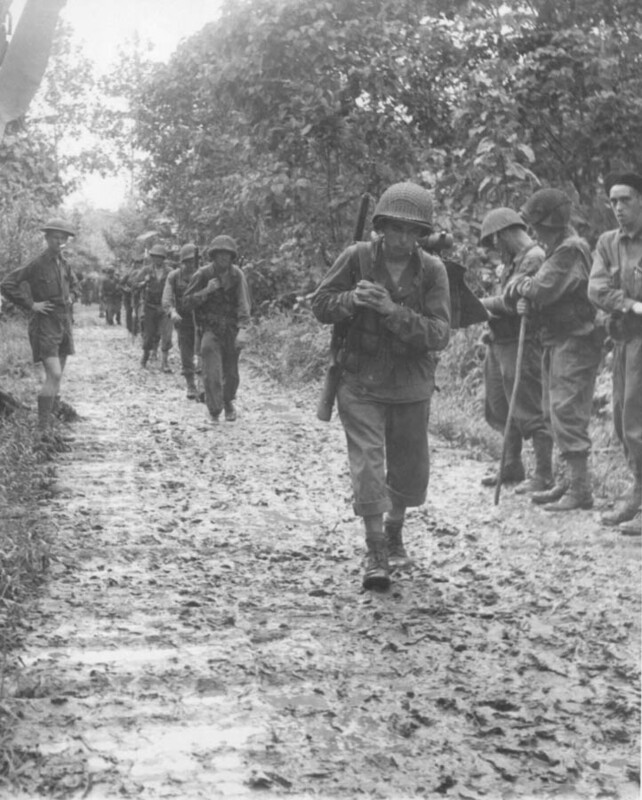 The crossing went well, until some men, in violation of orders, threw grenades, which attracted the attention of the Japanese. “At once the whole area broke into an uproar, the beach lit up with flares, and the troops were assailed with hand grenades, rifle grenades, and automatic weapons. (Milner 313)” The Japanese response caused terror and confusion in the pre-dawn darkness, which became even worse after Lt. Bragg was WIA. For a while, the wounded Lt. Bragg was MIA. As a result of the panic, some men, including the lieutenant who took charge after Lt. Bragg fell, and a sergeant ran toward the rear. COL Grose, observing the attack, put the lieutenant in arrest after he refused to lead the men forward. The sergeant was obviously wounded, so he was allowed to go to the aid station. COL Grose then found another NCO to take control of the soldiers who had fled and move them back to their positions at the front, which they all did. 1LT Fulmer, from South Carolina, was bestowed with the DSC for his actions on 31 Dec. ‘42 and 11 Jan. ’43. More information about him and his DSC can be found at: http://www.32nd-division.org/history/ww2/32ww2-4.html#Sanananda as well as the roster of DSC recipients. The Japanese situation was growing more desperate, in spite of the delivery of supplies by submarine on the night of 25-26 December. They continued to fanatically defend their position and a relief attack was being organized to the west, opposite the small 32D Division detachments around Tarakena. Several Soldiers earned the Silver Star for their gallantry on 1 January. Some of them are listed here and more information about them and their medals can be found on the roster of Silver Star recipients. Toward the end of the day on 1 January, an outpost had reported seeing Japanese swimming from the Mission (a.k.a. Government Station), a strong indication that the end was near. 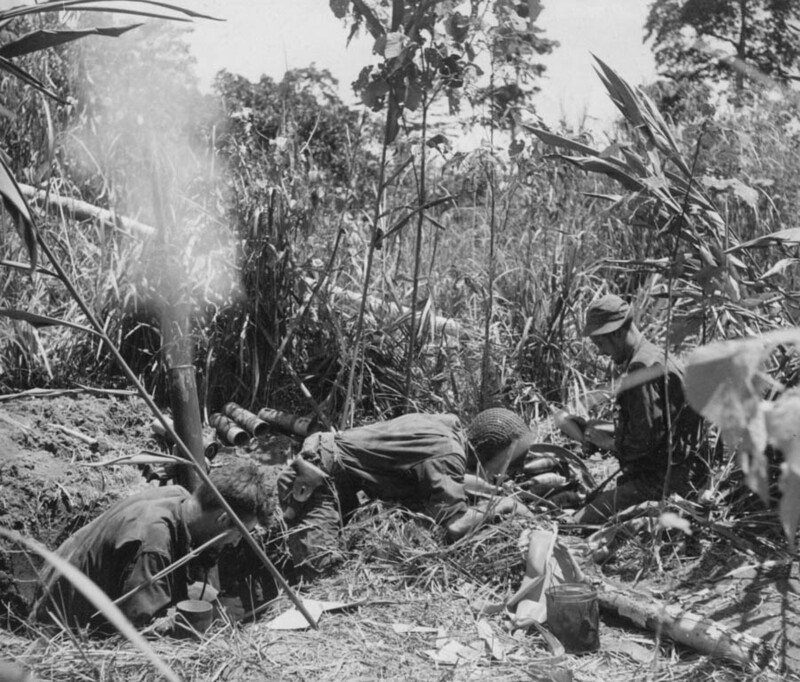 Soldiers of the Heavy Weapons Company, 1st Bn., 127TH Inf., 32D Division, firing into enemy positions at Buna Mission (a.k.a. Buna Government Station) on 1 January 1943. Several Soldiers earned the Silver Star for their gallantry in the effort to find and eliminate Japanese stragglers on 3 January. Some of them are listed here and more information about them and their medals can be found on the roster of Silver Star recipients. Soldiers from Co. G, 128TH Inf., 32D Division, firing rifles into a Japanese dugout before entering it for inspection on 3 January 1943 in Buna area. Soldiers of Co. A, 127TH Inf., 32D Division, resting after the capture of a Japanese position at Buna Mission (a.k.a. Buna Government Station), New Guinea on 3 Jan. 1943. Men in foreground are examining an old bell; others hold a Japanese sword and flag. Cpl. 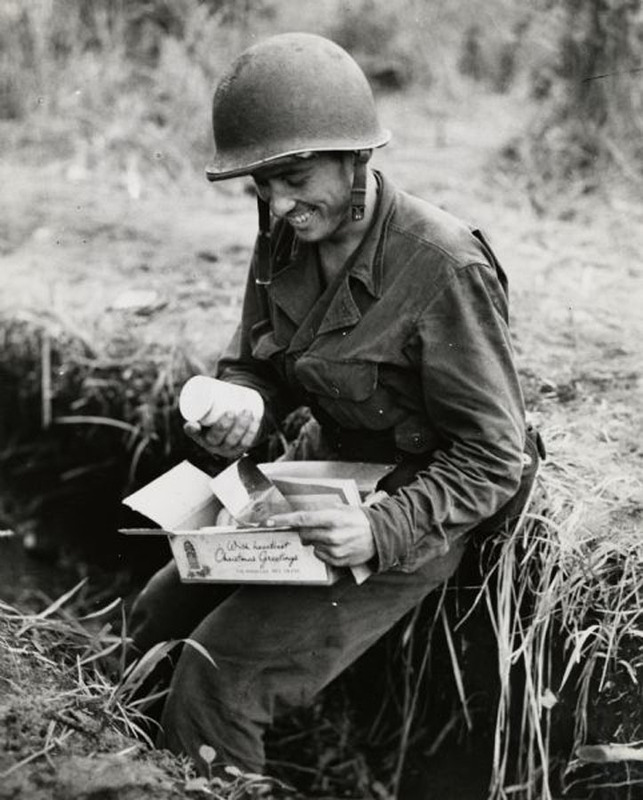 Frank Abrashinsky, from Sheboygan, WI, and assigned to Co. H, 127TH Inf., enjoys a Red Cross Christmas package near Buna on 3 January 1943. The Japanese relief attack, west of Tarakena, was just beginning when the 32D Division captured Buna Mission (a.k.a. Buna Government Station). Colonel Yazawa attacked Lt. Chagnon’s detachment anyway, to gain control of the spit off Tarakena, which was the goal of swimmers escaping from the Mission (a.k.a. Government Station). On 4 January, the day of the attack, Lt. Chagnon had received twenty-one reinforcements from Co. E, 126TH Inf., but this gave him a total of only seventy-three men (from seven different companies of two regiments). Short of ammunition and taken by surprise, the detachment was put to flight. All but four succeeded in getting to Siwori Village, mostly by swimming. Early on 5 January, Col. Grose had elements of the 127TH Infantry across Siwori Creek and moving toward Tarakena; the rest of the regiment was soon following. Return to the main Battle of Buna page. Kleber, Brooks E. and Birdsell, Dale. The Chemical Warfare Service: Chemicals in Combat. U. S. Army Center of Military History, 1966. Contact the 32D ‘Red Arrow’ Veteran Association Webmaster.